I’ve always known and feared that a day like this would come, when the Government of the UK abandoned all pretence of decency and showed the ugly, snarling face beneath the mask. I’ve always known it was there, layered away, momentarily dormant but virulent in potential, ready to burst forth like a fever from the pores of the host. If you looked carefully you could sometimes spot its outline. In newspapers that had never quite abandoned their “glory days” of cheering on the blackshirts and who still spouted their vile xenophobia, often poorly and gratingly disguised as jocularity. In the rhetoric of the pet politicians who vied for their column inches and who gave them tacit approval and borderline respectability. I saw a vivid flash of it when Margaret Curran, then an MP for Glasgow said that her son would become a “foreigner” if Scotland gained her independence. A foreigner. She almost spat the word like a bad taste from her mouth while those on the Yes side of the debate stared dumbfounded and wondered what she thought was so bad about people from other countries. I remember the dark language of Ian Smart, a Labour supporting Scottish lawyer who talked about the “turn on the Poles and the Pakis” that would come about if Scottish independence wasn’t successful. It’s like these people held up mirrors to their darkest British imaginings and recast them in Scotland. It was present every time there was a world cup or sporting event in recent decades. The media analogies to war, the racial stereotyping and insulting nicknames. The “frogs” “krauts”, “argies” and “sweaty socks”. The “poor football supporters” being picked on by “foreign” police who didn’t understand their ways. The justification and endless defence of the indefensible. It was there and in our faces on the 19th of September 2014 when the British nationalist thugs invaded George Square, rioted and tried to set fire to the offices of one of our newspapers. This was the true face, this was the beast unbound. It was there when the rules were set for the European referendum, excluding EU citizens from playing their part in choosing the future of the country they had made their lives in. Can you imagine the outcry if the Scottish Government had imposed a similar criteria in our independence referendum? That nobody born outside of Scotland could vote, no matter how long they had lived here? It would have been wrong in 2014 and it was wrong in 2016, it was another example of drawing lines and distinctions and it was another slip of the mask. The Brexit vote had been decades in the making, newspapers had been shouting about immigrants as long as I can remember and misrepresenting the very real achievements of the EU at the same time. All people seemed to have heard about Europe was red tape and straight bananas. There was no appreciation that their human rights derived from European legislation, that their right to travel to so many amazing countries without hindrance was also due to our EU membership. That the Government now seem to be able to speak so freely in overtly racist and xenophobic terms says a lot for the direction of the UK. To the people who talk about what they would have done differently if they had been in Germany in the 1930s I say now is your chance to prove it. There are dark days coming and we have one chance to escape them. If you don’t want to sink down into the murky depths of their xenophobia and hatred, it is time to man the lifeboats. It really is independence or bust. Great piece Steven. It hits the xenophobic nail square on the head. All so true. ..it’s time . Well said,couldnt agree more, I for one want no part of a racist facist country. Watching the evil pour forth from unionist politicians and hacks is frightening. 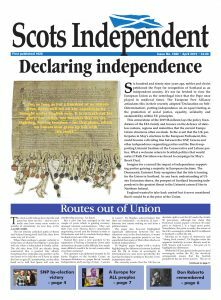 Independence is the only way Scotland can survive. Good article. If the 2014 referendum was a vote between independence and the status quo, feels like the next one could be between independence and an unbeatable, imposed, choking British Nationalism. Excellent article – I like it. It’s time the Scottish electorate woke up to the fact that we suffer from a greedy aggressive neighbour.